Corean Hamlin, Director of Education and Licensing, opened the one-day conference with a retrospective on why former Director of Education and Licensing Larry Outlaw initiated the first Educators Workshop in 1980. Commission Executive Director Miriam Baer, in her State of the Commission address, compared the accomplishments of the Real Estate Licensing Board of 40 years ago with those of today’s Real Estate Commission, and commented on the Commission’s current activities and initiatives, ongoing projects, and plans for the future. Hamlin followed with a comparison of the Commission’s education initiatives in 1980 versus today. Janet Thoren, Director of Regulatory Affairs, and Hamlin gave a joint presentation concerning rulemaking and current rules under consideration for amendment and answered questions from the attendees about rule amendments and the legislative process. Jake Gore, Chief Technology Officer, and Diana Carnes, Systems Administrator, described technology changes and demonstrated the Commission’s new online firm license application. Pamela Rorie, Continuing Education Officer, provided Continuing Education Reminders for continuing education sponsors and instructors and reported that more than 42,000 active licenses had not yet completed CE for the current license period. Kizzy Crawford Heath, Legal Education Officer, outlined the topics for the 2019-2020 Update courses and previewed the Commission’s new online NC Real Estate Manual. Deborah Carpenter, Education and Examination Officer, explained the many changes that have occurred in the Prelicensing and Postlicensing programs within the past six months and the changes to the license examination that will be effective on April 1. Katherine Buchholz, Education Officer, provided examples of student engagement techniques and games for the classroom. Thoren and Associate Legal Counsel I Madison Mackenzie outlined the license application process for candidates who have character issues and presented several license application case studies. During lunch, the North Carolina Real Estate Educators Association (NCREEA) held its spring business meeting under the direction of President Chris Barnette and elected new Board members for the upcoming year. Past President Len Elder officiated the Association’s presentation of its “Program of the Year” award to Stephanie G. Walker for her continuing education elective course, Risky Business: Doing It Right! Commission member Cindy Chandler accepted the award in Walker’s absence. Next, the Association’s “Educator of the Year” award was presented to Matt Davies. Also during lunch, Commission members George Bell, Sandra O’Connor, and Cindy Chandler presented the Commission’s Larry A. Outlaw Excellence in Education Award to Matt Davies. This award was established in memory of Outlaw, an attorney and Director of the Education and Licensing Division from the position’s inception for 35 years until his retirement in 2014. The Commission thanks North Carolina’s real estate educators for their continued interest and support, and congratulates Stephanie Walker and Matt Davies on their achievements. Matt Davies received the Larry A. 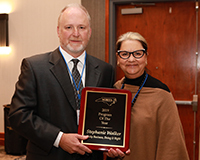 Outlaw Award for Excellence in Education, presented by Real Estate Commission member Cindy S. Chandler, and the Educator of the Year Award, presented by Chris Barnette, President of the North Carolina Real Estate Educators Association (NCREEA). Stephanie Walker received the Program of the Year award. 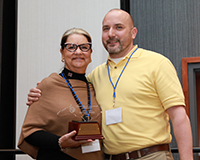 Cindy S. Chandler received the award in her absence from Chris Barnette, NCREEA President.